There’s so much to love about labdanum. I love the sound of the word. It’s a potential tongue twister but once you get it, labdanum is a fun word to say. I also love the story of this resin. Goats would feast on Mediterranean rockrose shrubs filling their bellies while unwittingly collecting the sticky substance in their beards allowing their keepers to harvest the fragrant goo. Labdanum is still obtained via trusty goats, but more often with *leather rakes empowered by human hands. What I love most about labdanum though, is its complex yet soothing aroma. All at once it encompasses a vegetal mossiness, subtle floral tones, calming incense and supple leather. The following was my impression the first time I smelled labdanum on its own: …”utterly rich and musty. It also struck me as quite leathery with great depth and amazingly animalic for a botanical”. How lovely I thought it would be to have a perfume composed mainly of this compelling essence. “Wrapped in the amber fragrance of Tonka and in the mystic aroma of the Arabic Frankincense, Labdanum wildness is tamed in an almost ecclesiastic scent that evocates at once the perfume of the mosques and the music of the wind organs in cathedrals. The scent of raw Tobacco, always present in the background, is like an anchor that binds the base accord, giving them a common denominator. The flowery notes of Indian Tuberose and of Damask Rose enrich the base of the balsam in the fashion of Arabic fragrances, bestowing to the perfume an opulence worthy of the precious aromatic elixirs worn by the royal family of Saudia. My dad has never smelled like labdanum and the florals didn’t blossom on my skin, but otherwise, I fully concur. 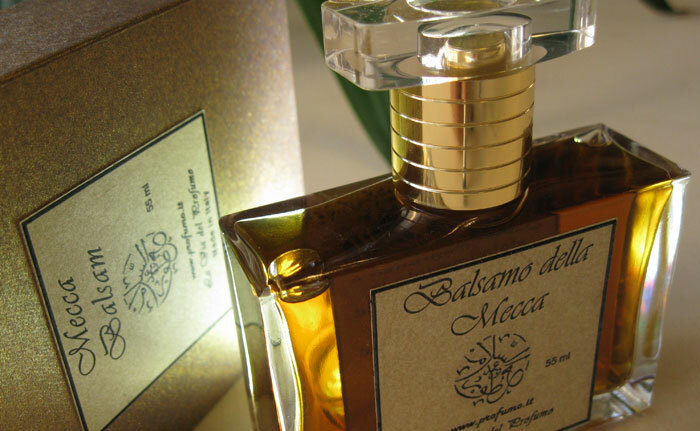 Mecca Balsam’s quartet of labdanum, frankincense, benzoin and tobacco suffuses the air with the caress of incense. The fragrance anoints your skin with a soft richness that has striking sillage and impressive staying power. It also layers beautifully with floral tobacco perfumes like Hermes Kelly Caleche and Ayala Moriel Parfums Espionage. 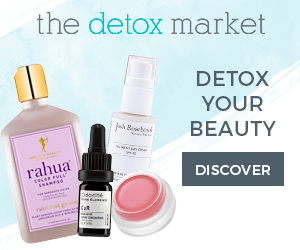 Dominique Dubrana has been very generous in offering a full 50ml bottle (worth $125 USD) to a Scent Hive reader. Please leave a comment to enter. 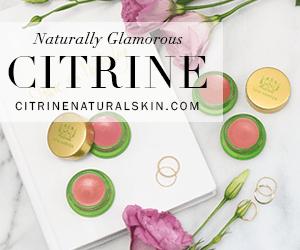 You can also get extra entries if you follow Scent Hive on Bloglovin, Twitter, Google Friend Connect, Facebook’s Networked Blogs, or subscribe to Scent Hive. (Check the right sidebar for the Scent Hive links). We have our winner! 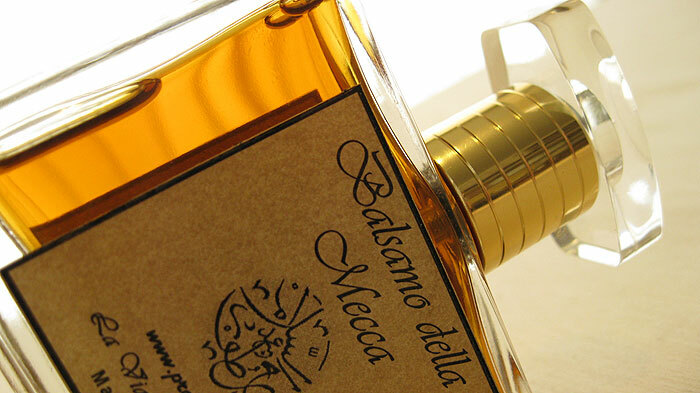 Mecca Balsam is available at the La Via del Profumo website. € 34,17 for 16mls and € 91,67 for 50mls. Please visit the NYT website for a feature on La Via del Profumo and Mecca Balsam. Disclosure: Samples from La Via del Profumo were provided for this review. The opinons in this review are my own. I was not financially compensated for this review or any other. Next Post Hourglass Cosmetics. Hard to resist. You are so thoughtful to include the Rumi verse…..just lovely! Love those Earty Goats too!! I’m yet to sample this perfumer, but his perfumes really do sound amazing! Sounds like a beautiful winter perfume, I can imagine it lingering on your clothes. Thank you Trish for yet another wonderful giveaway!! 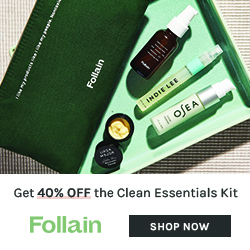 I follow Scent Hive via Google Friend Connect, Facebook’s Networked Blogs and am a subscriber also. I had heard about the goats, but even the leather rake method for collecting the resin is pretty special in view of the way most things are made in the modern world… Mecca Balsam sounds so gorgeous, and I love that it comes from a natural perfumer. Please enter me in the draw. I am subscribed and also follow on my Google Reader. I’ll enter you 3 times, and thank you for the follows. I would love to be entered in the draw. Thank you so much for such a great prize. We have La Via della Profumo to thank for the amazing prize. So incredibly generous! What a great give away!! Yay! Would love to be entered in! It really is a fabulous giveaway! Good luck and thanks for your comment. This sounds absolutely dreamy. Thanks you for enclosing the image of the labdanum harvest. The goat anecdote definitely adds to the charm of the fragrance. I know, I love that image of the labdanum harvest too. Be sure to check out the link to the image at the bottom of the post, it’s from a very informative blog, especially when it comes to labdanum! I love that visual of the goats! I’ve sampled some of LVdP’s scents but many I really wanted to try were sold out on TPC when I ordered. I would love to be entered for a chance to win a bottle of Mecca Balsam! Labdanum is really beautiful and one of the few substances that I’ve smelled that is complex enough all on its own. I enjoy his website too…lots of interesting and useful info. Cheers! I could not agree with you more about labdanum, it is so beautiful and complex, and Mecca Balsam is a wonderful fragrance. Thanks for your thoughts and good luck! I would love to try this perfume. I love Labdanum and deep intense scents of all sorts. I also follow you on Twitter. I enjoyed your post on this scent and the description of the goats with resin in their beards. I tried Dominic’s perfumes a few years back, and I was intrigued how his style of blending differed from those of NBP’s in the States. The scents seemed more exotic and heavier. I’d love to be entered in the draw for a full bottle of parfum! Best of luck and thanks for commenting! I would love to win a bottle of this . sounds sumptuous. I wonder why it didn’t go through the first time? Anyway, thanks for trying again, you are now officially entered in the drawing, 3 times! I would love to be entered in the draw! He really is talented. I have Tabac as well and it is just as fabulous. This one sounds really very good. I tried his Grezzo some time back, and enjoyed that one too. I’d love to be entered in the draw. I love that so many people are already familiar with La Via della Profumo’s natural fragrances! This sounds amazing – I’ve never tried La Via della Profumo before, so I’m keen! What a great giveaway, I would love to win this one! I’ve sampled several from La Via del Profumo’s line, mostly the animalic ones, and he does animalic very well. Mecca Balsam sounds wonderful. That’s 6 total for you. I wish you luck in the drawing, Mecca Balsam is really beautiful! I mightily resisted buying this blind because it sounded so good (I’ve started to understand that both labdanum and frankincense both speak to me), so, yes, I would really, really love to try this! Maybe you’ll get lucky and win the bottle?!?! If not, I wonder if there are samples on the website, I’ll have to go check that out. This sound like me, count me in the drawing. I’ve been told that I would love this partly because I can’t keep my sniffer from Tabac Blond. This Mecca Balsam sounds all the more — esp with the combination of the resins and Labdanum which is so intriguing. Please enter me in the draw as you have certainly drawn me in. I think Mecca Balsam would be a great pick for you since you love Tabac Blond. La Via della Profumo also makes Tabac which is a gorgeous tobacco scent, I’ll be reviewing it in the near future. I would love to try this, please enter me in the draw. Thanks for letting us know all these lovely perfumes and perfumers. Good luck and thanks so much for commenting. On labdanum, it’s a wonderful material. I have done some experimenting with making scents and while it’s exquisite it can be very overpowering so I admire people who can make it’s character remain but mix it with other oils. It makes me think of Princesses from the Levant in medieval times! Yup, labdanum has me under its spell too. I am thrilled La Via della Profumo has this beauty to share. I read the review on Perfume Posse and followed the link here. This sounds delightful! Please enter me in the drawing. Labdanum is fast becoming a favorite note in perfume compositions—and this one sounds wonderful! Please enter me into the draw. I meant to say one of my favorite notes! Will do Jessica! All the best to you in the drawing! I subscribed to your email list, and added your blog on Facebook as well. Thanks! Thanks for the follows 🙂 I’ll put you down for 3 entries. Please include me in the draw, it sounds like an incredible scent–who wouldn’t want to smell like the royal family? Love the Rumi verse, too. It was so sweet of Jennifer to add the Rumi verse at the beginning of the comments. It fits in so well with the nature of the fragrance. Will enter you in the drawing and good luck! This is such a beautiful review- it brought a bit of sunshine to this late winter, Midwestern morning! Thank you and La Via della Profumo for the great giveaway! Wow, what wonderful reviews this is getting. It’s true. We bloggers seem to enjoy it across the board. Good luck and thanks for entering! This sounds lovely-and it seems to be getting lots of attention. Please enter me in the drawing…Thank you! Kristin, I will certainly enter you in the drawing! Wow, not only does the scent sound amazing but the design on the bottle is gorgeous as well. Thanks for the drawing – please enter me! I love the presentation as well. My bottle is a little one, but it too is sweet and very lovely. I’ve been reading a lot about this one, and so far all reviews have been positive, I’d love to try it. This sounds reedonkulously good to me. Lovely review; thanks for writing about this stuff. Please enter me! It is outrageously lovely! Thanks for reading and good luck! I love everything incense, please enter my name in the draw. This one sounds amazing! I’d love to try this one, please enter my name in the draw! I hope I win this one!!!! It is amazing and I wish you much luck! Me! Me! Me! Pick me! Sounds fab and thanks for the great review. I would love to smell this, it sounds like the perfect antidote to winter. Mecca Balsam is a fabulous winter fragrance, warm and enveloping. Please enter me in the draw? Thank you! A wonderful review! This sounds like my idea of heaven. Please enter me in the draw. Good luck in the drawing for Mecca Balsam, it is heavenly. Thanks a lot , and btw that is an awesome review that makes me want to try it right now!!! I love Hinoki too. Mecca Balsam is smoother though and the labdanum makes it an earthy incense…..really gorgeous! This is a new lemming for me, thanks to all the mouth-watering reviews. please enter me! sounds lovely! please enter me in the drawing! Thanks for reading and I’ll enter you in the drawing. Sounds delish! Maybe I’ll get lucky! Well, I wish you lots of luck for the giveaway. Thanks for the review, it sounds lovely and warm… can I be in on the drawing, too, please? This sounds absolutely lovely (I adore incense-y frgarances and was just thinking I am running low) and a good antidote for all this depressing snow and slush. Please enter me in the drawing. This sounds really lovely (and so appealing with heaps of snow all around)! Please do enter me in the drawing. I just saw that you’re following me on Twitter now, so that’s 2 entries for you! I’m waiting for a split of this to arrive, but it couldn’t hurt to win a full bottle unsniffed, could it? Please put my name in the hat. Oh. I’d happily kill to try this, if only someone would help me bury the body! 😉 For the past two months, I’ve been writing a book where the scent of labdanum and incense play a not insignificant part, which is why, when I began reading these reviews, I became very hot around the collar! 😉 Please enter me into the draw, and thank you so much for a beautiful review! How fascinating that you are writing a book that features our precious labdanum! Do tell when it comes out will you? Would love to try this one! I’ve been following the chatter all over the scent boards – seems to have quite a following already. Must be fantastic! Thanks so much! I’ll enter you in the drawing, thanks for stopping by! this sounds lovely, and with all of you singing its praises, i can’t help but want to sample some of the joy. so, thank you in advance for entering me in your drawing. It sounds fabulous – does it smell anything like Le Labo’s Labdanum 18? I’d love to be entered in the drawing, thanks! hmmmm, Le Labo’s Labdanum…..I was in their boutique this past summer and remember not falling in love with anything. If my memory serves me correctly though, it was pretty musky no? Mecca Balsam is not musky! Mmmmm- sounds lovely. I too like the word labdanum. Please put my name in the hat! How can I resist? I’d love to be entered in the drawing. All the perfume blogs cannot be wrong … I’d love to be entered in the drawing. Thank you. I’m sure there are people out there who might prefer something else, but I’d be surprised if someone really loathed it. It manages to be special and unique while still being universally attractive. This scent sounds fantastic! I’d love to be added to the drawing. Thanks. Wow, if I don’t win your drawing, I’ll definitely add this to my Must.Try “wishlist”. Thanks for your review. Please enter my name in the drawing! I’ve been avoiding reading bout this one for fear that it’d flick a spending switch. See what you made me do! Hope you don’t mind a first time commenter enter the drawing? Thank you kindly! I will be back, to be sure! Been digging through the archives a bit and enjoying myself thoroughly. Cheers! I would really love to be entered into the draw! You are very welcome isadore 🙂 Thanks for reading! I will enter you in the drawing, and best of luck! Sounds absolutely beautiful! Please enter me in the draw – thanks! I sure will Chris, thanks for reading and best of luck! Oh, this sounds wonderful, I’d love to try it! I’m an utter hoor for incense scents, so do please count me in! This sounds like a perfume I’ve been wanting to try a long time! I’ve a dark rose oil from Arabian Oud which is absolutely stunning, and sounds like those two are related scentwise. The perfume of mosques and the music of the wind organs in cathedrals – oh, that sounds lovely. Please enter me in the draw, and thanks for the review. The scent descriptions on their website are really lovely. I certainly will 🙂 Good luck! Would love to try this one! Yes, a good one to try! Good luck! Please enter me in the drawing!! It sounds right up my alley,,,as does the whole La Via del Purdumo site. Oakmoss sounds really intriguing!! If I remember correctly, Tania Sanchez wrote a comment on NST praising Oak Moss. It too sounds wonderful! Sounds wonderful! Please enter me in the drawing! Well I knew that goats enjoy playing around but had no idea about their connection to labdanum! Fascinating. Thanks for the info and for the opportunity to enter the drawing. Such a great story with the goats, right? This sounds just gorgeous! I’d love to be entered in the draw.. Boy that sounds amazing! Can you please enter me in the draw? I’d love to enter you in the drawing 🙂 Good luck and thanks for the follow. That’s 2 entries for you! Yum. Makes me want to plant fields of rockrose and get goats.